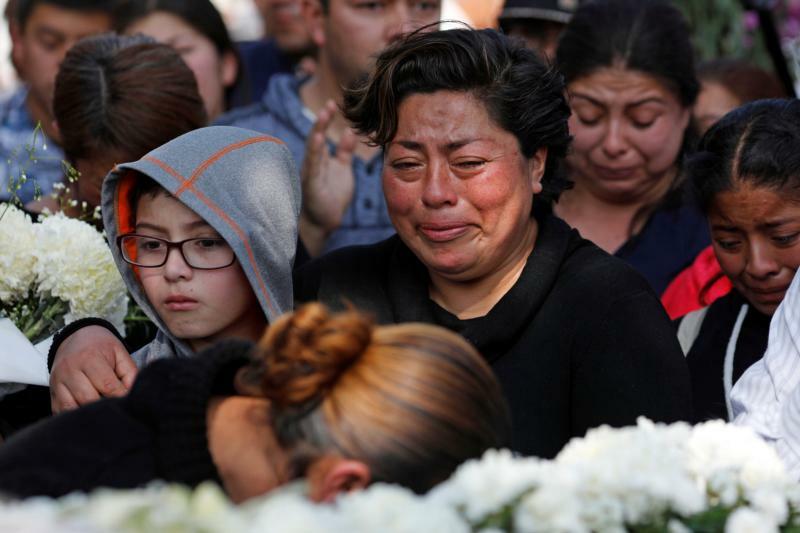 MEXICO CITY (CNS) — Mexico’s bishops offered prayers for the victims of an explosion in which dozens of villagers in the central state of Hidalgo perished after rushing to get some of the gasoline gushing from what appears to have been an illegally tapped pipeline. Priests in the Diocese of Tula provided spiritual support, visited the injured and started the process of saying funeral Masses for the deceased. But some priests and bishops have voiced support for a government crackdown on fuel thefts, a crime that has sent the homicide rate soaring in several states. The explosion occurred at 6:50 p.m. Jan. 18 in the town of Tlahuelilpan, 55 miles north of Mexico City, claiming 89 lives and sending dozens more to the hospital, said Hidalgo Gov. Omar Fayad. Videos on social media show people swarming a gusher of gasoline as an outnumbered group of soldiers, sent to stop such looting, look on. A local journalist told El Universal that locals brought their children and spoke of a festive atmosphere at the gusher — until it exploded. The cause of the explosion is still unknown. The explosion came as the country cracked down on fuel theft, in which gasoline — called “huachicol,” slang for poor-quality liquor — is stolen from pipelines and facilities belonging to the state oil company Pemex. The crackdown has caused fuel shortages, including in the area hit by the explosion, and long gas lines in at least six states. But President Andres Manuel Lopez Obrador, who took office Dec. 1, had defended it as necessary, saying it costs the country $3 billion annually. Opposition politicians and some analysts say the crackdown was poorly planned. But several bishops have publicly endorsed the president’s actions. “I invite citizens to support this measure, asking the authorities to not be intimidated by actions, which, in the past, were common and have caused so much damage, but to apply the law and promptly resolve this problem,” Archbishop Rogelio Cabrera Lopez of Monterrey, president of the Mexican bishops’ conference, told local media. Several traditionally strong Catholic states such as Puebla and Guanajuato have been hit hard by violence associated with fuel theft carried out by gangs, which have started to gain social support by providing jobs and cheap gasoline in poor places, according to analysts. The Archdiocese of Puebla has warned of fuel thieves venerating the “Santo Nino Huachicolero,” a Christ child resembling the Santo Nino de Atocha, but appearing with a gas can and a hose for siphoning fuel. “This cult violates the Christian commandment of ‘do not steal,’ a basic precept of the Catholic Church. It’s also contrary to civil laws,” Father Hugo Valdemar Romero, a former archdiocese of Mexico City spokesman, told the newsweekly Proceso.